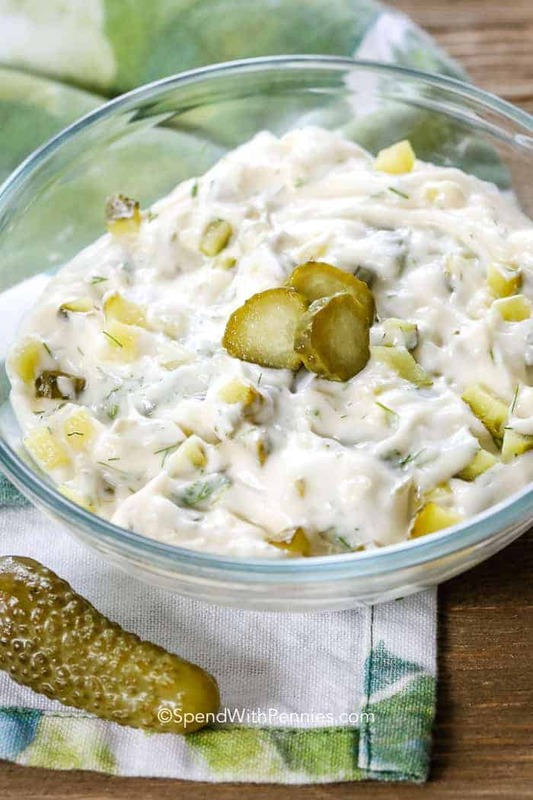 Dill Pickle Tartar Sauce is packed full of crunchy zesty dill pickle goodness! 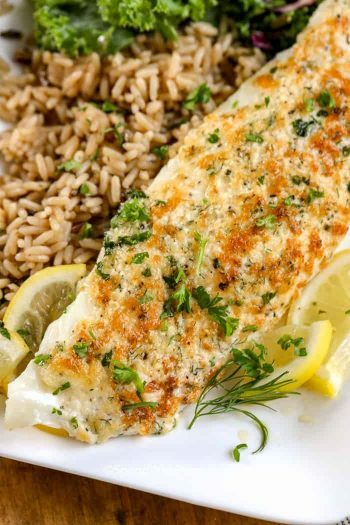 It pairs perfectly with fish, chips or fries, and even goes great on shrimp! 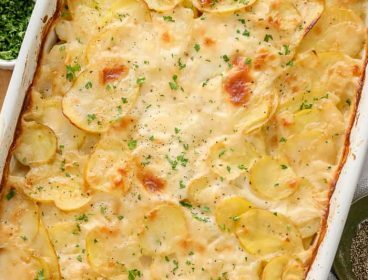 Everyone loves tartar sauce, but the store bought version doesn’t even hold a candle to its homemade sibling. You will be so surprised to see how simple it is to make homemade tartar sauce, packed full of fresh dill, dill pickle bits, and other great flavors! 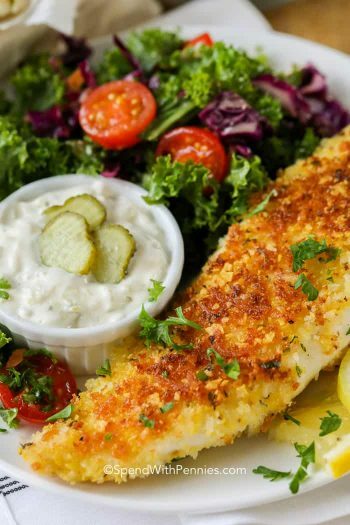 It wouldn’t be fish and chips without homemade tartar sauce – the freshness from the lemon pairs perfectly with the creaminess from the mayo. 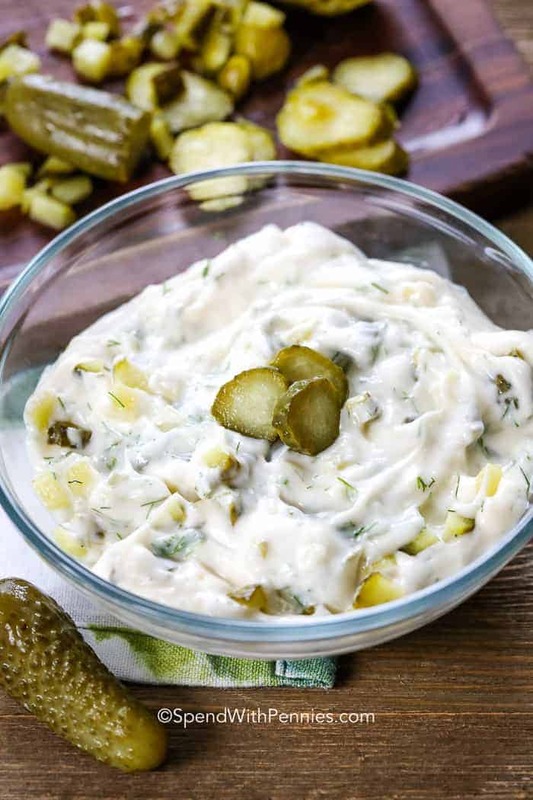 Add some zestiness from the dill pickles and you have yourself the best tartar sauce ever! It may be perfect on fish and chips, but it goes perfectly with just about any fish dish (I rhymed! 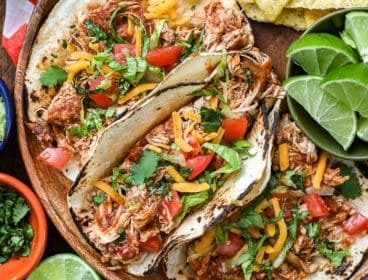 )… fish tacos are great with it too! What is tartar sauce? Tartar sauce is basically an aioli (or mayonnaise) sauce often made with sweet pickles although I prefer a zesty dill. This dill pickle tartar sauce tastes great because I add in some extra ingredients with max flavor – dijon, capers, and fresh parsley. 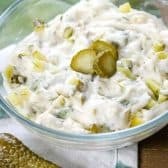 In this pickle tartar sauce recipe, I love using crunchy garlic dill pickles, as garlic is one of my favorite flavors and of course I’m pretty much a dill pickle addict (hence the Dill Pickle Pasta Salad I created). 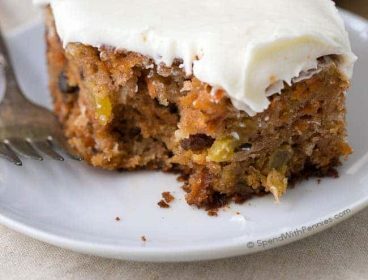 Sweet pickles also work great in this recipe if you have them on hand! We typically think of tartar sauce for just fish but it’s great for crispy oven fries, chips, or pretty much any appetizer. 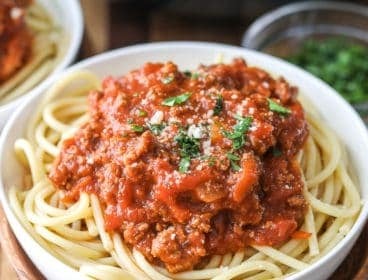 It’s as simple as mixing all of the ingredients into a bowl! Start by dicing the pickles into super fine pieces. Make sure they are pretty small, depending on how chunky you’d like your sauce to be. 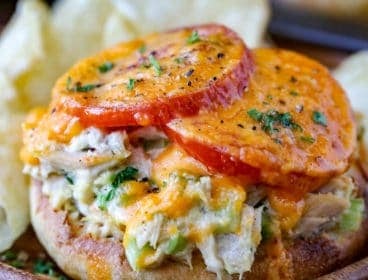 Combine all of your tartar sauce ingredients in a bowl, and refrigerate it for at least 30 minutes so that all of the flavors have a chance to combine and intensify. Homemade tartar sauce with dill pickles will last for about 2 weeks. Store it in your fridge in a bowl covered with plastic wrap, or transfer it into a mason jar. What does Tartar Sauce go with? 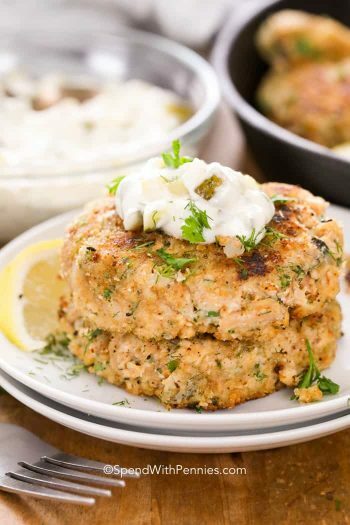 This quick tartar sauce can be served alongside some of your favorite dishes! 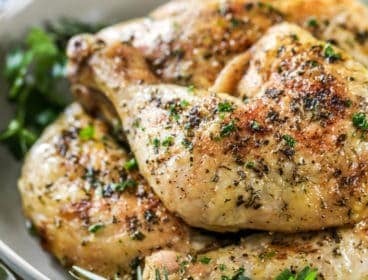 Oven Fried Chicken – try this combo, you’ll love it! Asparagus Salmon Foil Packets – a one pan meal! 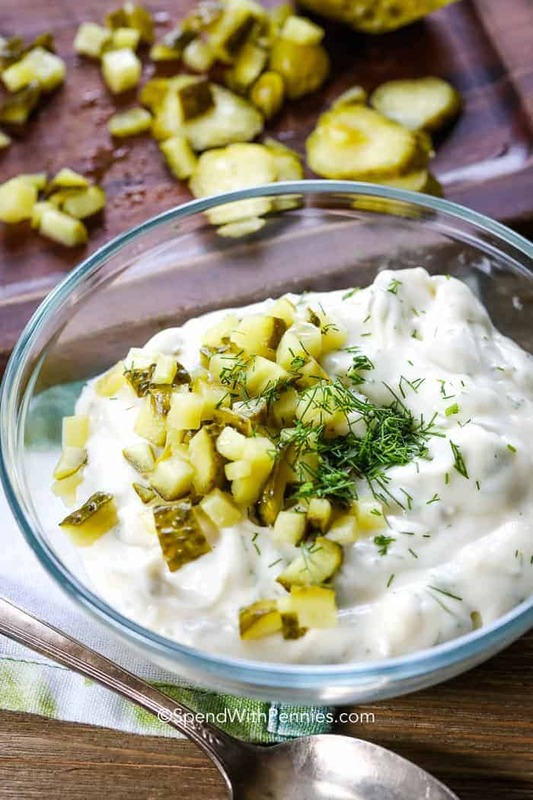 Zesty tartar sauce with lots of dill pickle bits. 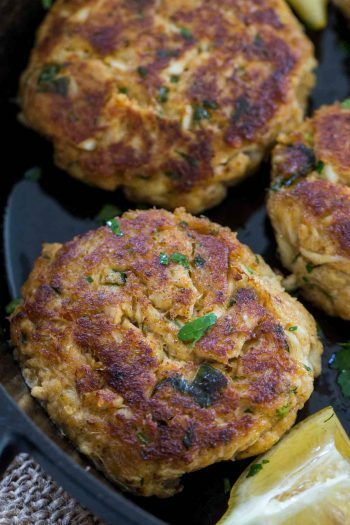 This is perfect for dipping fish, shrimp or your favorite appetizers. 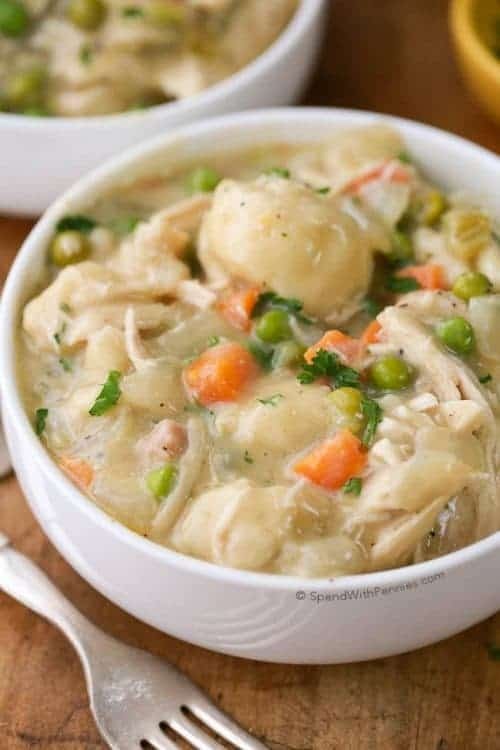 Store in the refrigerator up to 3 days.